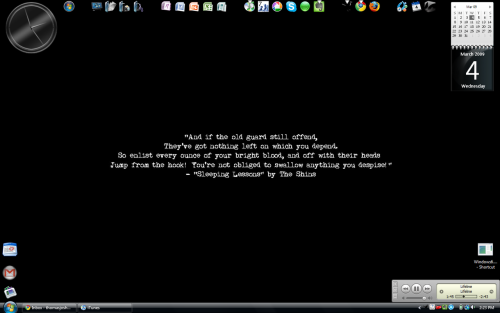 In case you’re interested, here is a screen shot of my desktop currently. I love the clean look and feel, especially once I figured out how to get the humongous shortcut arrows to go away and to get the text off of the icons, since I know what the icons are for anyway. The Shins quote was inspired by Dr. Goodman, my friend and mentor who died recently. (You can read more about Dr. Goodman, his death and my response here, here, and here. They’ve got nothing left on which you depend. So enlist every ounce of your bright blood, and off with their heads!